Sorry about the lack of posting lately... I have a ton of posts that I have started, but just can't seem to finish. This year has been a rough one for me & as the year continues, it seems to get harder. I haven't posted because I like to try to keep everything positive (no negative allowed on the blog). I hope within a few weeks of school being out that I will get motivated to share my ideas and publish more posts. The end is near... only 2 more half days!!! Hi Sandy! Thanks for stopping by my blog! Best of luck with these last 2 days of school! 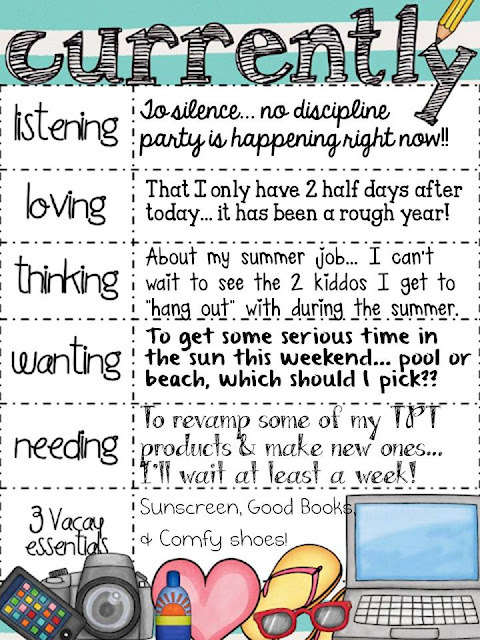 I can't wait to view the updated TPT products, but make sure you hit the beach first. I'm dying to dig my tootsies in the sand! Oh man, a no discipline party with only a couple of days left does not sound like a good thing. We've been having the same issues with our lunchroom. Sometimes I fee like I'm the one in trouble.